I should put “Parmesan cheese” in big quotations here, because this vegan version is definitely not cheese. Yet, it tastes quite similar to the real deal! 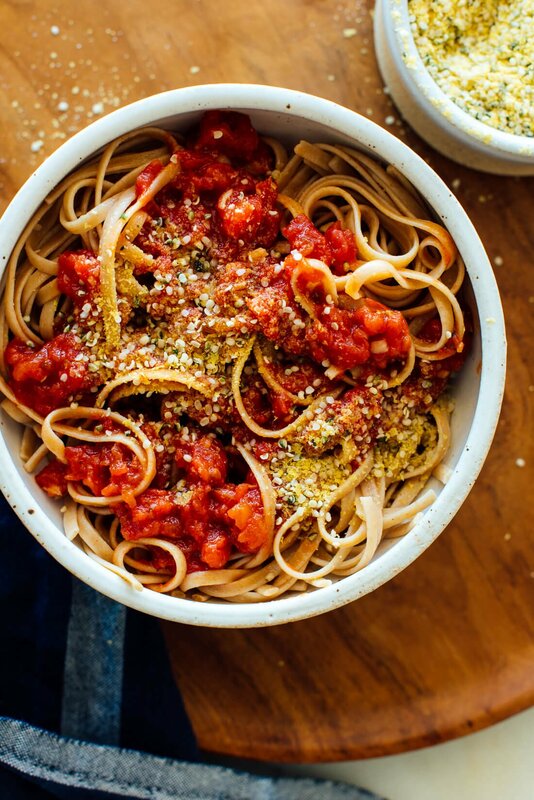 I’m loving this vegan Parmesan cheese recipe and I think you will, too. This vegan Parm is great sprinkled over savory meals in lieu of real Parmesan. Whether you’re vegan, dairy free, avoiding animal rennet, looking to limit your consumption of animal products, or just plain curious—this recipe is for you. I’m not the first person to come up with a vegan Parmesan cheese substitute. I’ve tried several recipes over the years, but none quite hit the mark. When I was wandering around Whole Foods the other day, I came across a vegan Parmesan blend in the refrigerated section. It used hemp seeds instead of raw cashews like I’ve used before. I was intrigued. I didn’t buy that vegan Parm, but the idea stuck with me until I couldn’t ignore it any longer. Hemp seeds seemed like a great choice since they’re tender, nutty, nutritious, and nut free (a bonus for my friends with nut allergies). Hemp seeds are also tiny, which meant that I could simply stir the ingredients together instead of making a mess in my food processor. So, I bought some hemp seeds on another grocery store run, and came home and started experimenting. Bingo! Meet the best vegan Parm I’ve ever had. You’ll only need five ingredients for this dairy-free wonder. Hemp seeds have a slightly nutty flavor and tender chewy texture, which makes up for Parmesan’s similar qualities. Hemp seeds are very nutritious, offering polyunsaturated fat, protein, manganese, magnesium and more. I bought my hemp seeds at Whole Foods in the supplement section, but they are less expensive on Amazon (affiliate link). Nutritional yeast contributes cheese-like flavor and golden yellow coloring. 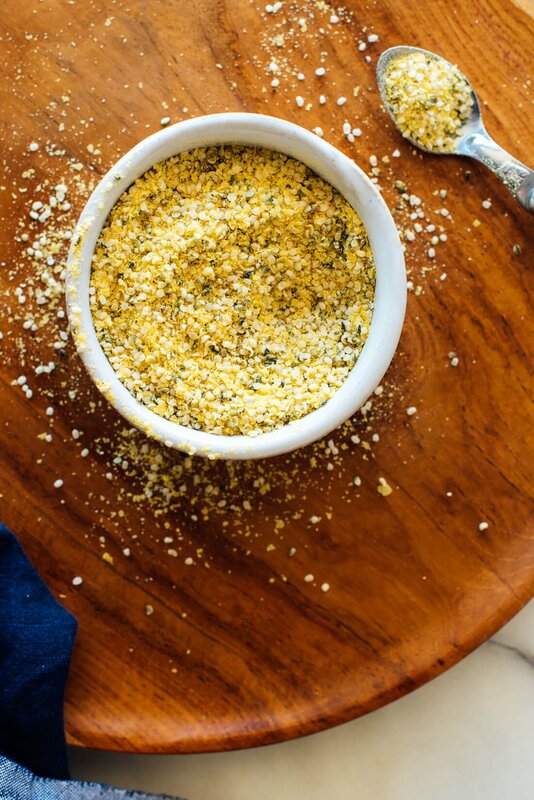 Nutritional yeast is also loaded with B vitamins, which is why just 1 tablespoon of this vegan Parmesan accounts for roughly 50 percent of your daily suggested intake of vitamins B1, B2 and B6 (click the “nutrition information” label below the recipe for more exact details). My favorite brand of nutritional yeast is Frontier Coop, for its superior flavor and small flake size. You can buy a big 1-pound bag of it inexpensively on Amazon. Another good store-bought option is Bragg’s. Do not mistakenly use brewer’s yeast here—they are not the same thing! These offer some extra flavor complexity that help make up for all the subtle flavors found in real Parmesan. Garlic and onion powder make this vegan Parm irresistible! Real Parmesan cheese is quite salty, so salt is an essential ingredient for this vegan version! I used fine sea salt, but you can use regular table salt if that’s what you have. 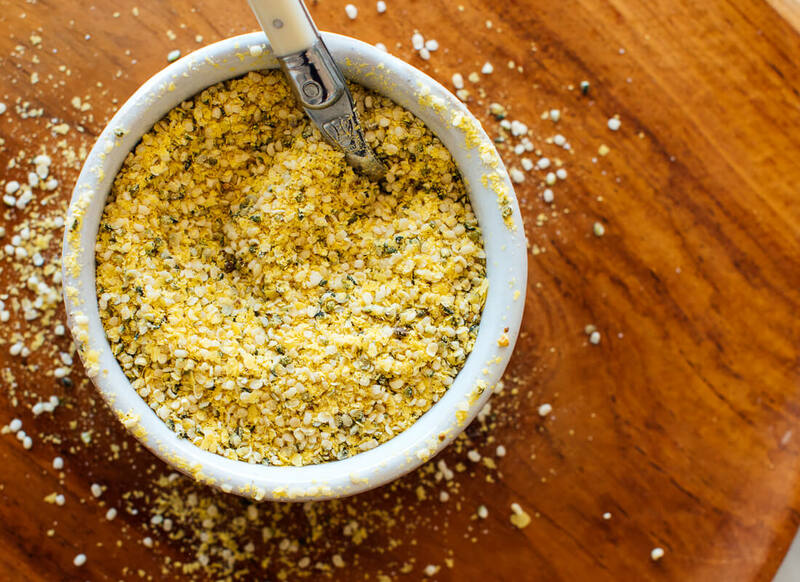 You can sprinkle this vegan “Parmesan” with abandon all over your favorite Italian recipes, salads, cooked vegetables and more! Use it like you would use Parmesan (however, if you’re baking the recipe, you might want to reserve it for sprinkling until after it’s out of the oven for maximum flavor and presentation value). 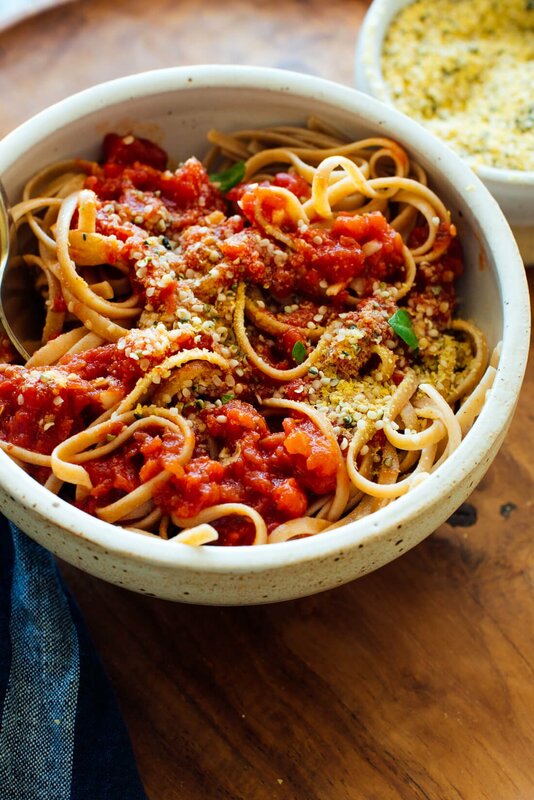 Sprinkle vegan Parmesan over marinara sauce and pasta (for heartier options, check out my hearty spaghetti with lentils and marinara and vegan puttanesca with zucchini noodles). 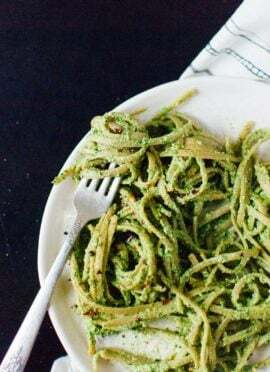 Omit the Parmesan cheese from basil pesto, then sprinkle vegan Parmesan on top of your pesto dish, to taste. It would be great on my double tomato pesto spaghetti recipe! Sprinkle it over roasted vegetables, like roasted broccoli or roasted cauliflower. You might also enjoy it over steamed or sautéed veggies. 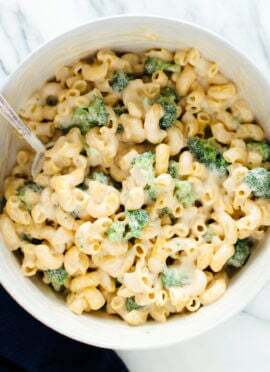 Take your vegan mac and cheese up a notch by topping it with a light sprinkle of vegan Parm. You might also enjoy it over homemade minestrone soup, or Italian chopped salad (in lieu of the provolone). Please let me know how you like this vegan Parm in the comments! I’m excited to hear how you use it. Make this simple vegan Parmesan cheese recipe and sprinkle it over your favorite Italian recipes! This vegan Parm is made with hemp seeds, so it’s nut free. No food processor required—just stir together the ingredients and you’re done. Recipe yields about ¾ cup. Simply stir together the ingredients in a bowl or jar until they are evenly dispersed. Taste, and add more salt for more intense flavor (I usually add another pinch or so). You’re done! Store this vegan Parmesan cheese in an airtight container at room temperature for up to 3 months. Hemp seeds! What a great idea. I’m trying to cut back on dairy and I love making vegan Parmesan cheese. I’ve made it with cashews but it takes some planning ahead to soak, dry, and blend the nuts. This recipe looks easy and quick to whip up while making pasta. I can’t wait to try! I know! I thought so too. Thank you for commenting. Let me know what you think when you try them, Kara! I made the vegan Parmesan cheese tonight and sprinkled it over my spaghetti and marinara. It added so much extra flavor! Delicious! You have a knack for reading my mind and producing a recipe that I’m in search of – Thank you!!! Can you recommend a hemp seed substitute? My husband is allergic. Would sesame seeds work? You’re welcome! It’s always great when that happens. To answer your substitution question, I tried sesame seeds instead of hemp seeds and they were nice, but had a significantly more pronounced nutty flavor. Another option would be raw sunflower seeds, pulsed in the food processor into tiny bits. Love this idea! I can’t abide the smell of Parmesan, and I have some hemp seeds that need to be used. Definitely making a batch of this soon. Be sure to report back on what you think! You make my day too! I will be trying this recipe. Thank you for continuing to be such s creative “healthy” cook. Trying to cut back on dairy, so I’m definitely going to give this a try. A couple of questions: Should this be stored in the fridge or is the pantry okay? And how long do you think it can be stored? Store this vegan Parmesan cheese in an airtight container at room temperature for up to 3 months. Thanks for the question and commenting, Marcia! Be sure to report back! I just made this, and it’s really quite good! Thanks for a great cheese substitute, Kate. Thanks, too, for so many other great recipes. You’ve helped to move us toward delicious vegetarian eating! Just made this. However, I blended it all so as not to have the whole hemp seeds. I added extra salt which has made it a bit too salty. It’s good but a little too gritty I find. I’ll be adding it to my pasta this lunchtime! Thanks for the recipe. Thanks, Josie! Did you try it pre-blending? I appreciated the light chew of the hemp seeds, but didn’t find them gritty in their whole form. This is exactly what I have been doing for the last few years. I was a big Parmesan cheese eater and when I went vegan I discovered mixing this together and prefer it way over Parmesan . Be sure to report back when you try it, Forest! Making this stat! Never met a cheese I didn’t like. Excellent. I typically opt to make parmesan at home, since it’s faster than running to the store! This looks yummy and so much easier than making it with cashews. Thanks, Kate! One question: you mentioned that you should sprinkle it on after baking for maximum flavour. Can you use it in baking, not on top (eg. as an ingredient in a lasagna) instead of Parmesan? Great question, Jan! I think it would be great layered in lasagna instead of Parmesan. I would use less of it, since it’s so flavorful. I think a light sprinkled layer will do! Thanks, Kate. I’ll give it a try. This recipe is great! 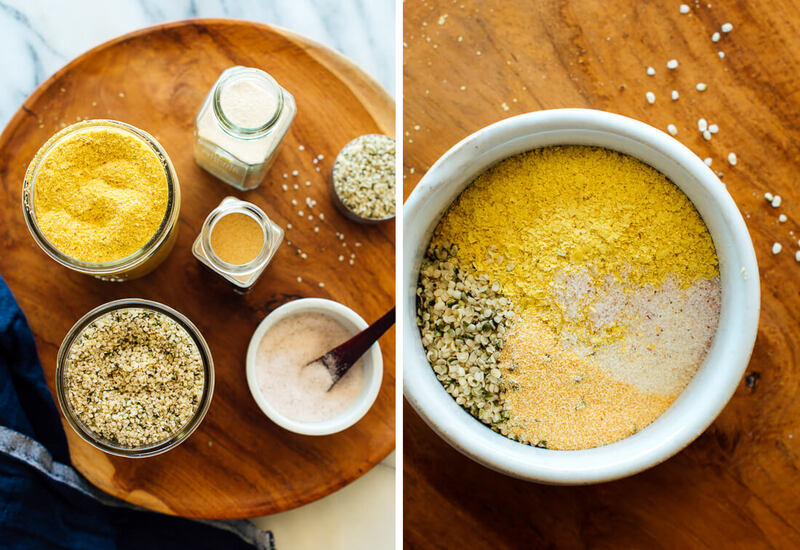 SO easy and it tastes just like parmesan–and a perfect way to use up a bag of hemp seeds in the back of my pantry. Thanks for such a creative and tasty recipe! You’re so welcome, RJW! I’m really glad it passed your taste test. Thanks for the review! It’s really packed full of nutrients! Thanks for your comment, Elissa! I may have exclaimed, “Kate!! !” after mixing this up and trying a bit – such a fabulous recipe! It’s so simple and so good. The flavour is complex – much more so than nutritional yeast alone – and the texture of the hemp seeds is super satisfying. This will be a pantry staple from now on and I’m so excited to sprinkle it over basically everything. Ha, ha love it! I’m so glad you love it. Thanks for sharing, Sarah! What a nice blend. Can’t wait to make it! I have all the ingredients! THANK YOU THANK YOU THANK YOU!! I have a severe nut allergy and I can never eat vegan parmesan cheese recipes because they always involve nuts. This is going to be a staple recipe for me. Thank you for always posting nut alternatives in your recipes. Keep up the amazing work! You’re very welcome! It has been on my mind for while. I’m so happy it works for you! Thanks! Love to hear what you think when you try it. Oh goodness, more power to you! I’m glad this worked well for you though to help you with your transition, Carolyn. Made this yesterday and love the taste, texture and ease of prep. I’ve made other faux parms over the years, using ground almonds, white miso and nutritional yeast most recently, but this is definitely better, not to mention so much easier. Thank you, thank you! Oh, and since I didn’t have fine sea salt on hand, just ground in some Himalayan pink salt, which I don’t think appreciably changed the flavor profile. You’re welcome! I’m glad this one met your expectations. Thanks so much for the review, Jeanne. Just what I’ve been looking for! I’ve been trying to go dairy-free and had not found a good Parmesan substitute until this. I tried it with pasta first and then when it passed that test, I tried using it on an entree for dinner for my husband who hates the smell and taste of real Parmesan cheese. He loved this! So excited to have this in my Vegan Wannabe arsenal! I’ve tried another vegan parmesan recipe with cashews but never remade it because it was too much of a hassle. This recipe is easier and tastes better. Last night we used it on the Tuscan White Bean, Kale & Farro Stew recipe from your cookbook and it was fantastic! That recipe gets 5 stars too! I’m excited to be able to keep vegan parmesan on hand at all times with no effort. Delicious combination, Genevieve! I love it. Thanks so much for letting me know what you thought! I made this and it was fantastic and everybody loved it. Because we’re recommended to avoid too many oil seeds here in Finland (heavy metals), I made the second batch using almond meal instead of hemp seeds. Not as melt-in-your-mouth delicious but serviceable. That’s interesting! Thanks for sharing. I bet others will find that helpful! Yes, one of the recommendations I hate, but I guess it’s good not to mess around with heavy-metal risks and small children. Will still make the real version occasionally, though, ’cause it’s SOOO good. I bet that will work just fine, Natalie! Thanks for letting me know what you thought! 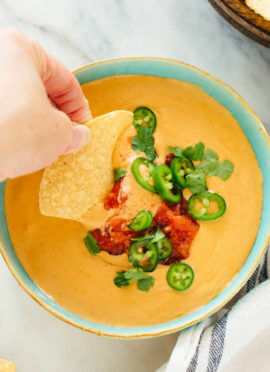 Love this easy and delicious recipe! Thank you!